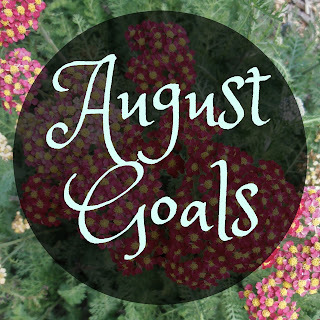 July is in the rear view mirror and August is laid out all flat and full of promise in front of us. So, that means it's time to look back at how July went and what we're planning for August. Let's jump right in. Hang up gallery wall. Well, it's in progress. The frames are bought, and I have five pictures up. But, it turns out a lot of the pictures I planned on using can't be blown up to 5x7 pictures, let alone 8x12. So, it's taking a little more time than I planned. But, I'm happy with the progress so far. Write one hour a day, five times a week. Blah! I was able to get more blog posts up, but didn't do much other writing. Cook one new recipe a week. I only managed two new recipes. One wasn't very tasty, but the roasted cauliflower was pretty good. I've made it twice already. Take two fun excursions. I managed to take four! Two kayaking trips with some friends. Tried out a new coffee shop and explored the used bookstore in the next town over. And, visited Brunet State Park for a nice hike. Lose four pounds. Ugh! Stress eating really did a number on me. I gained three pounds. Read five books. Nope. Only got three done. Sew up two old WIPs. Only managed one and it was a tiny one. But, it was an old one. Daily devotions. Struggled. Getting back on track though. Love people more. Oh my gosh! I swear as soon as this one came out of my mouth, the challenges started. I'm sure a lot of it is stress related. I'm more on edge. I was eating crappier food. I wasn't exercising. Everyone and everything was irritating me. What can I say, it's a work in progress. Alright, here's what my August plan is. Reestablish morning routine. I need to get back into some healthy habits. Start back with morning pages. I have all sorts of thoughts rolling around. And I need to find some sort of outlet for all that. Walk at least three times a week. I need to get more exercise just for my mental health, if nothing else. Clean eating. No more potato chips. Sew twenty things for up coming craft fairs. Got a lot of little projects lined up. Read six books. With all the extra time I have had off lately, I figured I should have enough extra time. Four creative excursions. Nothing fancy, just something to liven up the daily grind. More blog posts. I'm aiming for twenty. That'd be more than I accomplished in any prior month this year, but like I said, more free time. So, how'd your July go? Get anything crossed off that had been on your to do list? Want to see what everyone else is up to? Check out the link up at My So Called Chaos. Must be the phase of the moon or something. I've hit the same wall! August is already going much better! I just felt like I didn't have the motivation to finish anything in July.